Launched yesterday in Ca 'dei Carraresi shows linked to the Provincial Environment Day. Four exhibitions: the Public Bicycle ", historical photos on bicycle, school and the world" Project Environment ". Present President of the Province of Treviso, Leonardo Muraro, the Provincial Environmental Policies, Ubaldo Fanton, and Iuav teacher who has followed the project, Carlo Gaino. A container of events and initiatives to raise awareness and inform people to culture and the environment, which in this second edition has seen the membership of 64 municipalities of the territory. 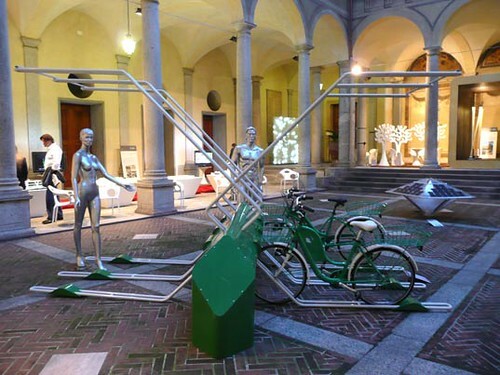 In particular, this exhibition presents the bike-sharing project built and promoted by the Province in collaboration with the IUAV Venice. This is a pilot project of bicycle rental in the city to move freely and not be tied to the use of the car. The goal of the province is to sensitize people to the use of sustainable half what bicycles. There are 11 municipalities that have joined during the project. But Ca 'dei Carraresi addition to panels of IUAV with drawings of the prototype bike racks and will host the exhibition dedicated to photographs that have historical protagonists as always the two wheels and two exhibitions of work carried out by schools in projects environment, "said the President of the Province of Treviso, Leonardo Muraro. "That of bike sharing is an important project for the area because it helps to establish a culture of sustainable mobility. In much of Europe, and France in particular, the initiative is already consolidated and, outside the metro and bus stations, it is easy to see the public rack for tourists and people in general. Brand Trevigiana in trying out the project in Treviso, which has provided 20 places to 100 places, Conegliano Veneto Mogliano and with 10 places and Castelfranco Veneto with 16 places. It was not easy to start with this project, we have been involved since the district trevigiano bicycle to get a project done entirely at home, but we have met with some suspicion. Yet thanks to the collaboration with IUAV we got to have the prototype of the bicycle that will be realized and distributed, now on display at the exhibition "the councilor said Fanton. "We worked hard, trying to create an original product and functional - said Carlo Gaino - fully designed and built in Italy.There must be synergy between the world of creativity and business, otherwise it is impossible to develop the ideas of young designers. "These bikes are a great product." At last the opportunity to see, concretely realized, 2 prototypes of the bicycle and the rack to serve as "parking" for a bike and an interface to the public, who will have access to various information and services from the same point. 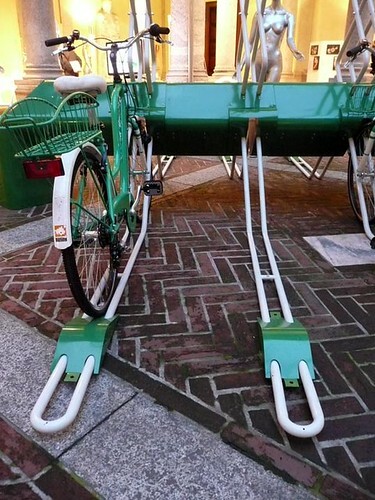 The projects stem from the work of the students in design at the University of Treviso Iuav of Venice for the new system of bike-sharing, which will be tested by the Province of Treviso in cooperation with 11 municipalities, including the provincial capital. The establishment runs all project phases, from initial design up to the prototypes in collaboration with some companies in the District of Cycling. The bike-sharing is a new service that will allow all citizens to move into city centers, and not only through the use of bicycles "out there" that can be taken and repositioned as desired in any of several shelters located in various places of the city. Produced in collaboration with FAST (Photo Archives of the Province of Treviso) show exposes the historical images on the means of transport of the past, with particular attention to mobility in cycling in the countryside and the city of Treviso in the past.